It helps to have basic knowledge of the conditions that generate and shape waves. Fortunately, as a 21st century surfer, you can find a wave near you by using online surf reports and a few basic rules of thumb. The average report forecasts waves based on swell direction, wave height and local wind conditions. When all 3 line up, its time to get stoked. When they don’t, it becomes a lot trickier. Here are a few tips to help you understand ocean and surf conditions and how to read a surf forecast. This way you can gauge what’s coming. Firstly you need to know which direction your beach faces. This will have an impact on the waves. For example, in the South West, when a surf report says a west swell is on the way, they are describing waves originating from the west. 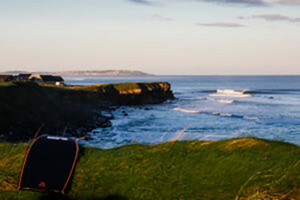 Lets assume your local faces due west; the swell will hit your break straight on. If they are forecasting a southwest swell, then the swell will hit your break at an angle from the SW, giving you a different looking wave all together. Knowing what swell directions work best for your local surf spots comes with time spent in the water. Checking your favorite surf sites each day doesn’t hurt either. How big is it going to be? 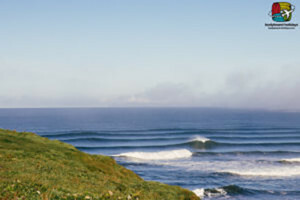 Most surf report sites will interpret the important points for you and provide links. To know how to read a surf forecast, you’ll need to understand the lingo, such as swell height and swell interval (time between waves). “3 feet at 10 seconds” is an example reading from an offshore buoy as the waves pass by. It describes the height and time between each wave. Both numbers are critical in judging the size of the waves that eventually hit your local surf spot. A longer interval means a larger wave. “3 feet at 4 seconds” is a insignificant wave. “3 feet at 18 seconds” and I’d recommend you call in sick for work. Add a large swell to a large interval (10 feet at 22 seconds) and you can anticipate massive surf. The size, quality, speed and very existence of a wave depend on your local tides. That’s why you have to factor in the tide cycle to understand ocean and surf conditions at your local beach. Some spots work better at low tide than at hide tide and vice versa. Beginners take note: just because a spot is known as a low tide break doesn’t mean you can’t have uncrowded fun during a high-tide session. All it means is that the spot works best at low tide. Tides affect water depth, which in turn either exposes or hides the ocean floor that is necessary for a wave to break. Offshore and onshore, what does this mean? Imagine you are standing on the beach facing the ocean with a strong breeze in your face. In other words, the wind is blowing onto the shore – onshore wind. An onshore wind turns the waves into confused, choppy surf. It becomes bumpy and more difficult to ride. Offshore winds, winds that blow off the shore and into the coming waves, groom waves by lightly holding them up before they break. The only wind better than offshore wind, when swell is in the water, is no wind at all. A swell that is met with no wind results in a glassy day, a day when the surface of the wave resembles glass. A clean swell is the thing of surfer’s dreams. Hopefully this helps you in your search for the perfect wave! Why not join a bodyboard coaching weekend and improve every aspect of your riding!